Capacity: 500gram / 1.1 lb Divisions: 0.1 g / 0.01 oz. 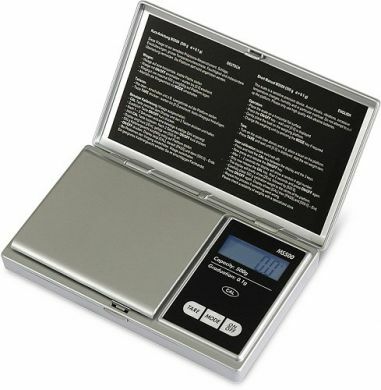 Professional digital pocket scales have four different weighing units. Stable hinged cover protects the whole scale from dirt and damage. Quick user guide in German and English on the inside of the cover. Other features include load cell with innovative design for extreme overload resistance, linear and fine electronics with very precise measuring results even at the edges of the platform, and the large platform is the highest element of the scale which allows weighing of oversize goods. The flat design perfectly fits a waistcoat pocket. Capacity: 500 g Model, 500 g / 17.65 oz. / 321.5 dwt / 7716 gn. Readability: 500 g Model, 0.1 g / 0.01oz. Linearity: ±0.1 g. Tare Range: up to 100% of capacity (does not reduce weighing range). Units: 500 g Model, g, oz., dwt, gn. Power: 2 “AAA” batteries. Display: 4 digits, 10 mm high, with backlight. Pan Size: 3.03" x 2.6". Dimensions: 5" x 3.03" x 0.75".